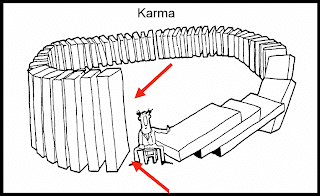 I've been reading about karma a lot lately. The mystical-spiritual success folks like Deepak Chopra and Florence Skovel Shinn (more on her later) are big on it. One aspect they're particularly keen on is choosing your words carefully, so you create good karma. Right speech, in case my tens of readers aren't up on Hinduism and Buddhism, is part of the Eightfold Path to enlightenment. For Chopra this is all about creating an intention that can then grow into the perfect success you crave. He suggests writing a list of your desires, which you look at before meditating, before turning in for the night, and first thing in the morning. Stating what you want plants the seed. Time, and your rapt and focused attention on the present, takes care of the growth and blooming. Shinn is more about getting the right prayer to Jesus Christ (oy) and having your wish granted out there in the world right now. For example, she talks about a client who was broke at Christmas time and who needed cashish. F. S. Shinn told this woman to act as if she would have the money by buying wrapping paper and ribbon, meanwhile saying a prayer. Dubious, the woman left. She did as she was told, and that very evening, upon returning home, discovered a check in the mail from a distant relative. Deepak Chopra is a little less definitive about wish-granting. He clearly has a thorough knowledge of karma. In fact, he cautions that once you plant your intention, you have to let go of trying to control how and when your wish will be granted. This is his escape clause to his otherwise pretty astonishing assertions of our personal power to attract "abundance" to ourselves. 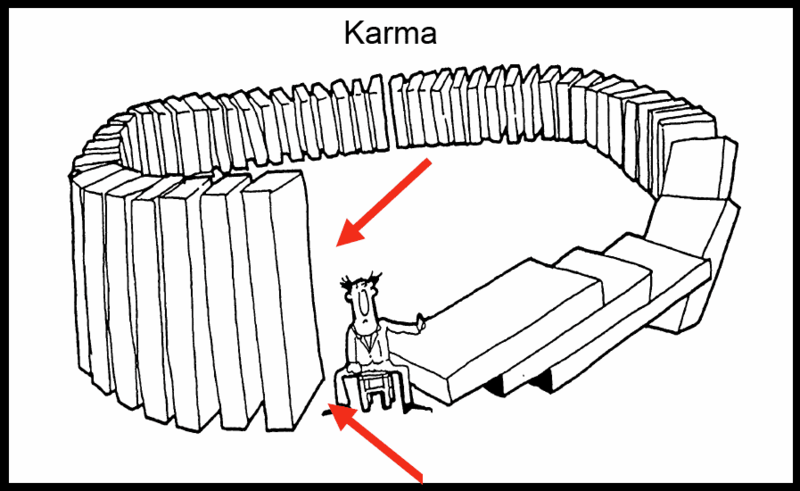 Karma may cause this abundance to occur in a profoundly different way than we might have intended. Or at a different time. So how bad is it that I lost my temper on the phone when some poor telemarketing person interrupted me, deep into my list of desires, to ask for the scofflaw who used to have my home phone number? I didn't mean to. It was just that I was so deeply concentrating that the call really got to me. In fact, the number of calls I receive for this debt-ridden, possibly ill and elderly man named Joseph Addario (this is a common name, so I mention it without pointing a finger at a particular scofflaw) has dwindled from several a day, two years ago, to one or two a month, usually. You may ask why I didn't change my number two years ago. And I considered it, but when I learned that phone numbers become available for reuse after only 30 days, I figured I'd be just as likely to end up with a different scofflaw's former number, so I stuck with the scofflaw I knew. Yesterday I recognized the number on caller id as one that had been calling for a few days, annoying me. So this time I answered, preparing to give my long-winded explanation and ask them to remove me from their call list; but I just wasn't as nice as I could have been. I asked them to remove my number a little louder than I meant to. As I mentioned, I was deep in thought. I was considering the implication of adding "screened porch" to my list. Should I ask to be able to add it on to my house? Or would it be better to simply ask for a screened porch -- once I relinquish my attachment to the way in which my intention for a screen porch manifests (Chopra word), I will be able to see the good, perhaps, when I am forced to sell my current house and move to a small shack--with a spacious screened porch attached. I hope Joseph Addario is having a good day. A formalization of the "what goes around comes around" is the delightful book "The Gift" by Lewis Hyde. It gives a structure to the "gift economy" and makes it sound like the type of obligations that we want-- non-monetary, non-transferable, difficult-to-quantify. But I am now blown away by David Graeber's new book the history of Debt (which I am only 1/3 the way through, but scribbling it up, reading it aloud to family members and generally loving it). It is grounded in anthropology to find the underpinnings of economic relations get expressed. And it is not what I thought. Anyway, it is a bit way from Karma, but it is all about how to live together well. It can be so frustrating to get those calls. I'm sure the powers that be will forgive you, especially if you do better next time.